Supplementary material reads: "Gershon. City desk. Illus. Champion minesweeper. The minesweeper USS Redstart (named after a bird) is known as the minesweeping champion of the Korean war. Photo shows her skipper, Lt. Carl W. Coe, 1968 Chestnust Avenue, Long Beach, getting bronze star from Captain C.E. Coffin, Chief of Star, Naval Base, Los Angeles. 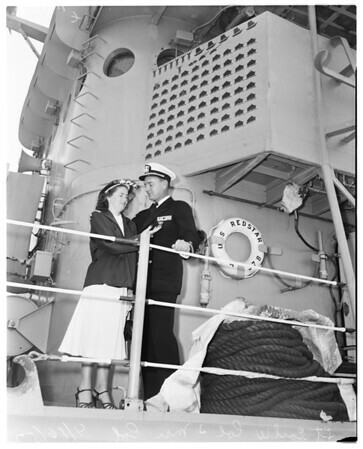 Lt. Carl W. Coe and Mrs. Coe standing under scoreboard of minesweeping champion. During her operations in Korea she sewpt 80 communist mines, sank five sampans and destroyed two tanks and a weapon carrier by gunfire and captured 8 prisoners as shown on scoreboard".